Popular since it was announced in 2007, the 6.5mm Creedmoor cartridge has gained a cult following for its excellent long-range ballistics. 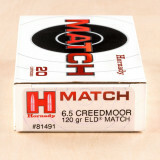 6.5 Creedmoor ammo was launched in 2007 by Hornady and has seen a wide following develop over the years since it's initial launch. It is an excellent long-range rifle load with sub-moa accuracy out to 1,000 yards and has a growing number of ammo manufacturers now commercially loading it. 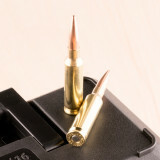 This load is designed for both short-action bolt rifles as well as AR-10 semi-autos. 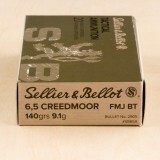 Sellier & Bellot launched their line of economical 6.5 Creedmoor ammo in 2018 and it's been incredibly popular from the start. 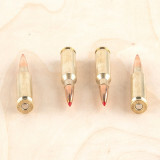 These rounds feature a 140 grain full metal jacket boat-tail bullet and with this product, you'll get the entire bulk case of 500 rounds. 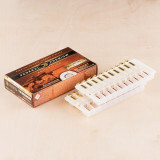 The ammo comes packaged in 25 boxes with each box containing 20 rounds that are ready for your rifle. 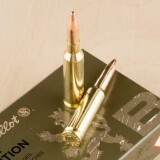 Sellier & Bellot is known for world class ammunition that is produced in Eastern Europe. 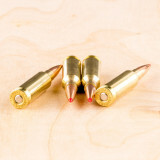 Their rounds are famous for reliability at a cheap price --- a combination that just about any shooter can appreciate! Hornady designs their American Gunner ammunition for the selective sportsman who wants the impeccable performance of their premium factory loaded rounds for a competitive price. 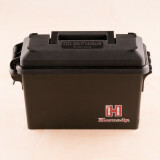 The 200-round ammo can is the perfect way to store this 6.5mm Creedmoor, and it is fully reusable. 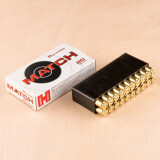 Each cartridge is assembled with a 140 grain boat tail hollow point (BTHP) projectile that blasts out of the barrel with match-grade accuracy at 2690 fps. 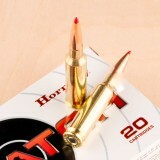 Hornady has loaded premium hunting, sporting, and self-defense ammunition since 1949. 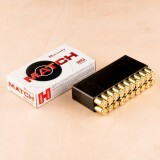 This 200-round bulk pack of ammunition is an affordable way to get your hands on top shelf range ammo that is a blast to shoot. 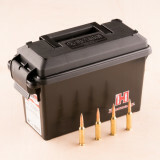 Order this 6.5mm Creedmoor American Gunner ammo can today! Precision competitors will love these rounds for match use or range days when a new scope needs to be zeroed. 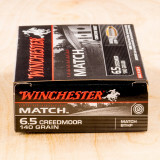 This 6.5mm Creedmoor ammunition is made by Winchester using their own original components; these include reloadable brass casings that have been inspected to ensure consistent outer dimensions and flash channels with correct diameters. 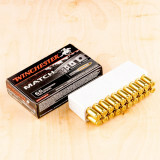 Each casing is outfitted with one of Winchester's reliably igniting Boxer primers which lends a spark of flame to a measure of powder that burns efficiently for optimal muzzle velocity. 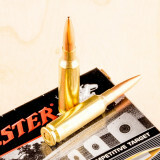 This load profile is finished using a 140-grain BTHP (boat-tail hollow point) projectile. 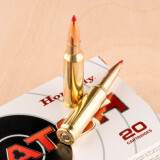 140 grains is one of the heavier classifications of loads originally developed by Hornady when they invented the 6.5mm Creedmoor caliber; that means that these loads will follow well-established drop tables for easy ranging. 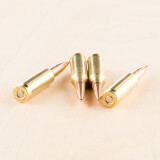 BTHP bullets are highly accurate at a distance due to their construction method which calls for feeding lead into a pre-formed copper jacket, resulting in a uniform shape, core density, and overall balance. The tight meplat and tapered rear help resist drag in-flight for remarkable stability all the way to the target. 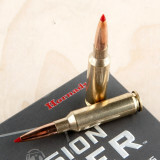 This 6.5 Creedmoor cartridge was created by Hornady solely with accuracy in mind. 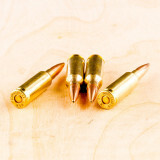 These 200 rounds’ casings are all extremely uniform to one another, and accordingly carry consistent propellant charges and seat their bullets as flat as can be. Their primers are non-corrosive, and their propellant burns exceptionally cleanly as well, so firing a bunch of these rounds won’t cause your rifle’s ability to shoot straight to go south quickly. They’re these rounds’ bullets that make them truly exceptional, however. The ELD Match always keeps a sharp and even meplat, no matter the temperature that aerodynamic heating cooks it to, because its Heat Shield tip won’t deform or otherwise warp when subjected to dramatic air friction. The ELD Match’s AMP jacket is virtually perfectly concentric, which combined with its uniformly dense core gives it the rotational stability indispensable for straight flight. The ELD Match further boasts an impressive ballistic coefficient, as its secant ogive geometry and narrow base create extremely drag in flight. With so much going for it, there’s little reason to wonder why match shooters so frequently favor the ELD Match. It wasn’t enough for Hornady to merely introduce the 6.5 Creedmoor cartridge to the world in 2007 -- the Nebraskan manufacturer would also see to it that theirs would be without peer. 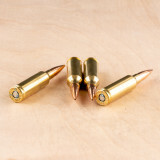 They’ve arguably accomplished that feat with this round, which is crowned with a 140 grain ELD Match projectile. The ELD Match’s accuracy is simply astounding thanks to a number of its features, including its Heat Shield tip which resists aerodynamic heating so that it may always keep its perfect shape. This bullet’s ballistic coefficient is heightened substantially by its boat tail design, and its ability to find its target is further strengthened both by its streamlined secant ogive profile and concentric AMP jacket. It’s a fine choice for hunting and competitive shooting alike, making this round a truly versatile investment. This round’s new production brass casing boasts extremely uniform wall thickness and concentricity, so it delivers reliable performance both inside and out of a rifle. Its clean burning propellant and non-corrosive primer further assure that your action’s and bore’s lifespans won’t be shortened by caustic residues. 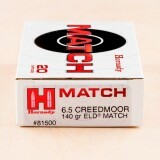 Hornady makes this 6.5 Creedmoor cartridge with accuracy in mind, and they achieve that end perfectly thanks to the round’s 147 grain ELD Match projectile. The ELD Match’s ballistic coefficient is through the roof thanks not only to its boat tail design, but also its extremely concentric AMP jacket which improves its rotational stability as well as its streamlined secant ogive profile. The bullet’s Heat Shield polymer tip even further optimizes its shape for flight, and because it is not susceptible to the effects of aerodynamic heating it will maintain its pointed meplat no matter the velocities it achieves. 2019 marked Hornady’s 90th year in business, a feat they’d never have accomplished without their admirable track record of delivering shooters the goods. 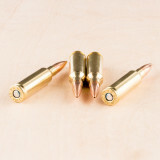 These rounds’ brass casings have been specially selected for the uniformity of their dimensions, and their propellant creates the pressure and velocity that are optimal for their caliber. 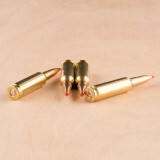 "Ten bullets through one hole” -- that’s Hornady’s company motto, and one you can very well bring to life with these 20 rounds. 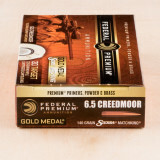 This 6.5 Creedmoor cartridge from Federal’s Gold Medal line of ammunition features a 140 grain Sierra MatchKing projectile. A popular choice for match shooting events, this bullet’s high ballistic coefficient is largely the result of its boat tail design, giving it remarkable accuracy, resistance to wind drift, and ability to maintain momentum downrange. This bullet’s jacket is built to stellar concentricity, and its uniform core further improves its stability in flight. 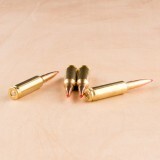 This bullet is not only optimized for accuracy, however, as its hollow point design causes it to expand dramatically within soft targets. Its straight flight path and devastating terminal performance makes the Sierra MatchKing a versatile choice, no matter what you’re shooting for. 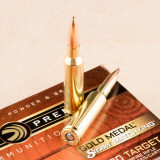 This cartridge’s benchrest quality Gold Medal primer is both sensitive and uniform, and thoroughly complements its bullet’s ballistic performance, and its propellant is specially formulated for its caliber. It’s perfectly reloadable thanks to its proprietary brass casing as well, so 200 of these rounds will serve your Creedmoor for several trips to the range or field to come! 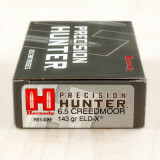 This 6.5mm Creedmoor ammo is loaded with Hornady's supreme Extremely Low Drag (ELD) projectile with the revolutionary Heat Shield plastic tip. 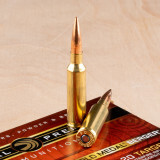 These 140 grain projectiles feature a heat resistant tip that can withstand high velocities without deforming which can decrease accuracy and impact BC. Hornady has some of the most stringent quality control practices in the business, and they test the performance of their ammunition using Doppler radar to ensure a reliable BC is achieved with every shot. 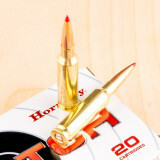 Hornady uses top quality components for this 6.5mm Creedmoor ammo. Each round is encased in a new-production brass casing with clean-burning powders that minimize fouling, as well as non-corrosive Boxer-primers. 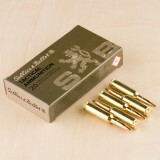 The casings are reloadable for extra value. 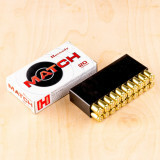 Hornady's Match ammo is renowned for its pinpoint accuracy, round uniformity, and reliability. 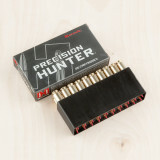 Shooters rely on Hornady ammo for a variety of applications including match/target shooting, hunting, and self-defense. 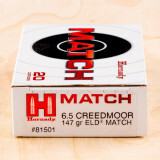 Order 20 rounds of this premium 6.5mm Creedmoor match ammo and get ready to win some competitions! Don't miss out on this new addition to Federal's revered Gold Medal brand. 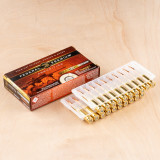 These loads come fitted with projectiles from Berger, one of home reloaders' favorite companies in terms of finely made bullets. 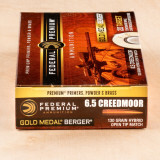 This 6.5mm Creedmoor cartridge utilizes Berger's Hybrid Open Tip Match (OTM) projectile which weighs in at 130 grains and pairs best with a barrel twist rate of 1:8. The Hybrid OTM features a boat-tail bottom for drag resistance, and parallel mid-body for rifling contact, and a sleek ogive for clean feeding and minimal in-flight disturbance. 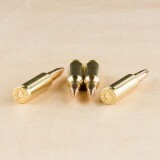 Each bullet is mounted in Federal's own reloadable brass casing. As a Gold Medal standard, each brass casing has been meticulously inspected for a proper flash channel, correct wall thickness, and a flawless shoulder angle. The casing houses clean-burning powder which is ignited by a spark from a non-corrosive Boxer primer. The primer itself is bordered by sealant in its pocket, preventing moisture from resulting in a dud-fire after long bouts of storage or during long-range precision matches that place in humid settings. When it comes to hunting ammunition, you should never have to sacrifice exceptional accuracy for devastating terminal performance, or vice versa. This 6.5 Creedmoor cartridge from Hornady’s Precision line of ammunition offers both in spades thanks to its technologically advanced ELD-X projectile. The 143 grain bullet features a Heat Shield tip which is virtually immutable by aerodynamic heating, so it will maintain its pointed shape even as it exits your muzzle at a velocity of 2,700 fps. Along with its tip this bullet’s boat tail design, highly concentric jacket, and secant ogive profile work together to create the extraordinarily flat trajectory you need for pinpoint accurate shots. When this bullet strikes targets at higher velocities, its InterLock ring and thick jacket shank assure weight retention of up to 60 percent. At lower velocities, its polymer tip initiates violent yet controlled expansion along with deep penetration and up to 90 percent weight retention. Its tremendous versatility makes this the round to count on the next time you venture into big buck country.